A rare “Fish Rain “scene is reported from Ruhuna Campus. A “Fish Rain" in which fish fallen with rain drops reported yesterday evening at Agriculture Faculty of the Ruhuna University situated at Kamburupitiya,Matara. 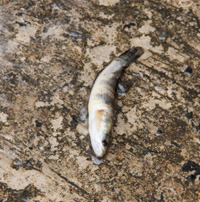 It is believed that this Fish Rain is due to a Tornado condition. Lenabatuwa Lake is close to the faculty.